What’s going on with Germany’s big banks? Ten years after the global financial crisis the country’s two leading lenders are in worse shape than ever. On the international stage, in their profitability and market valuation, Deutsche Bank and Commerzbank now play only a marginal role. Chaos in management and strategy, incessant scandals, nose-diving share prices and now, even the exit from Germany’s blue chip index have all accompanied the former heavyweights’ downfall. While Germany’s economy keeps growing at a healthy clip and the country remains Europe’s political and economic locomotive, its banks – i.e. the backbone of the economy – are caught lagging behind. 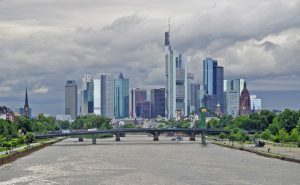 As a European banking market slowly takes shape and the EU moves ahead with plans for a banking union, the German players watch from the sidelines, too preoccupied with their own problems. Policymakers in Berlin worry that the two banks will become mere pawns in the looming consolidation of Europe’s banking sector instead of helping shape the transformations. A brief look at market valuation reveals the gulf between the German, French and Spanish lenders. Both France’s BNP Paribas and Spain’s Santander have market capitalizations exceeding 70 billion euros, which is three and a half times that of Deutsche Bank. Even numbers two and three in France can easily take on Commerzbank (market cap 10 billion euros). The gap with US banks is far wider. “Since 2012 the profits of American banks have been at least double those of their European counterparts,” says a recent report by consultants Ernst & Young. And the gulf, it adds, is widening. US banks got back on their feet quickly following the financial crisis and forced capitalization by the government. Currently they are benefiting from the booming domestic economy and Donald Trump’s tax reform. While interest rates at historic lows continue to depress revenues in the Eurozone, the Federal Reserve began raising US rates long ago, ensuring a more amenable banking environment. At the Frankfurt bank summit, German Finance Minister Olaf Scholz expressed the government’s wish for a big and strong German bank that can accompany the country’s booming exports abroad. With this in mind, the possibility of merging Deutsche Bank and Commerzbank has repeatedly been considered. But both lenders’ CEOs consider such plans illusory, at least in the shorter term. Christian Sewing and Martin Zielke instead point to the unfinished business of restructuring both businesses. A hurried merger would resemble an emergency operation with an uncertain outcome. The reasons for the decline of Germany’s once-proud lenders do not lie only in the 2008 financial crisis. They were primarily homemade: mismanagement, chaos at the top, loss of trust. For Deutsche Bank things began to sour when Germany’s then-flagship lender joined the free-for-all adventure of investment banking. With the takeover of US investment bank Bankers Trust, then considered the bad boy of Wall Street, the heretofore antiquated Deutsch-bankers set themselves a challenge they would not rise to. Two worlds collided in the process. Bankers Trust epitomized the brash new Wall Street approach to moving markets, while Frankfurt remained the domain of pinstriped banking with private customers and lending to midmarket companies and prosperous industries. The outcome of this Kulturkampf is well known: The investment bankers won the upper hand and made the lender their cash cow. CEOs Hilmar Kopper, Rolf Breuer and Josef Ackermann failed to rein the investment bankers in. Tasked with rolling out a new beginning at Deutsche, the following chief executive tandem of Jürgen Fitschen and Anshu Jain, installed by still-serving supervisory board chair Paul Achleitner, could not implement a new culture at the lender. In 2015, despite the bank posting billions in losses, it also paid out 2.4 billion euros in bonuses. Billions more in write-offs and massive legal costs for its scandals followed. Deutsche Bank is an illuminating case study of what happens when a company hurriedly adopts an Anglo-Saxon business model that does not fit, writes economic historian Werner Abelshauser. Now, Deutsche Bank is caught in a strategic trap: Investment banking, which once guaranteed high profits, no longer works. And in retail and corporate banking, Deutsche does not have the necessary size. Germany’s other big private sector bank offers a similarly bleak picture. Commerzbank had to be rescued from oblivion with billions of taxpayer euros in late 2008. Its takeover of Dresdner Bank shortly before Lehman Bros collapsed proved disastrous for Commerzbank. Several subsequent changes in strategy have since cost the bank its very identity. One handicap against international competition is Germany’s splintered banking market. While the country’s consumers benefit from the intense competition by paying less for financial services than their European neighbors do, the banks themselves are saddled with inadequate market share and profit margins. 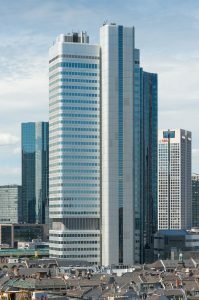 France’s five biggest banks, including BNP Paribas, Societé Générale and Crédit Agricole, account for over 80 percent of the domestic market there. Germany’s top three manage barely fifteen percent. The relatively profitable and stable retail market is firmly in the hands of state-affiliated savings and loan banks (Sparkassen) as well as cooperative Volks- and Raiffeisenbanken. Sparkassen alone take 40 percent of the domestic market. Also, Germany is “overbanked.” There is a bank branch for every 2,500 citizens. In Sweden that figure is 5,000, and in the UK even 6,000. That keeps costs high and binds capital that would otherwise go toward investments such as foreign expansion or digitization. Both German big banks share a fear of being taken over from abroad. Switzerland’s UBS is reportedly interested in Deutsche, while BNP Paribas and Italy’s Unicredit are believed to have Commerzbank in their sights. The fates of Germany’s two big banks are not yet clear. Over the medium term a merger is very possible. A “Deutsche Commerzbank” would be number three on the European market while fulfilling the wish for a German national champion. Yet a foreign takeover, including a hostile one, cannot be ruled out given the lenders’ depressed share values. For the historian Abelshauser there is only one way forward for Germany’s export-based economy: back to the roots, i.e. back to the business of financing corporations that leave their mark internationally.